I confess: I lied — or rather, I helped to propagate a legend. 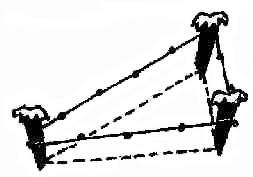 Scholars tell us that the Egyptian rope stretchers did not use a 3-4-5 triangle for right-angled corners. They say it is a myth, like the corny old story of George Washington and the cherry tree, which bounces from one storyteller to the next — as I got it from a book I bought as a library discard. None of the Egyptian papyri that have been found show any indication that the Egyptians knew of the Pythagorean Theorem, one of the great theorems of mathematics, which is the basis for the 3-4-5 triangle. Unless a real archaeologist finds a rope like Alexandria Jones discovered in my story, or a papyrus describing how to use one, we must assume the 3-4-5 rope triangle is an unfounded rumor. Then Why Did I Tell the Story Like That? On the other hand, students today do need to know the Pythagorean Theorem and to be familiar with at least a few specific examples. As you go through your high school and college math classes, you will find 3-4-5 (and 5-12-13, 7-24-25, 8-15-17, and more) triangles popping up in all sorts of problems. I hope that reading about and working with “the pharaoh’s treasure” will help you remember a few of these useful math facts. If the sides are proportional, the triangles have to be similar. If you cut an isosceles triangle in half, you get two right triangles. Get four pegs and three ropes. Two of the ropes should have an odd number of knots, evenly spaced. (The reason for an odd number is to make it easy to find the center.) One of the knotted ropes must be much longer than the other. Peg the shorter knotted rope along the line of your wall or the edge of the farmer’s property, with the center knot where you want the right angle to be and one knot exactly at each peg. This will form the base, or bottom line, of your isosceles triangle. Tie the longer knotted rope to the same pegs, so that it also has one knot at each peg. Stretch it tight to form a triangle, and put the third peg at the center knot to hold it in place. Tie the third rope to this last peg and stretch it out until it passes the center knot of the first rope. Use your last peg to hold it in place. This rope will be the altitude of your triangle, and it will form a right angle with the first rope. Make the base of your isosceles triangle with either 3 or 5 knots, putting the center knot where you want the right angle and one knot exactly at each corner pin. Then pin the center of the rest of the string as far away as it will stretch, making two equal sides for your triangle. Stretch an extra piece of string from this top corner down past the center of the base, which will form your right angle. 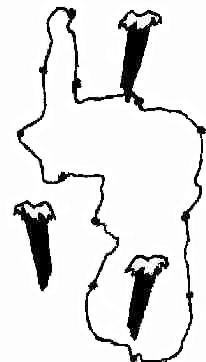 Did you try to find the area of the Egyptian farm (pdf)? Divide the property into rectangles and right triangles, calculate the area of each piece, and then add the areas all together to find the total area of the farm. The answer to this problem will depend on what size the map came out when you printed it, because each printer has its own idiosyncrasies. Also, there will be round-off error and slight differences in the way people measure (did you read the inside of the dark line, or the outside, or try to estimate the center? )—so I don’t expect your answer will match mine exactly. But the order of magnitude should be the same. My map had the long line at the bottom almost exactly 7cm long. I was able to divide the farm into one large rectangle and five smaller right triangles, and I calculated the entire area as about 45 square cm. Since one cm stands for 60 cubits, each square cm represents 60 x 60 = 3600 square cubits. So the total area of the farm on my print-out was approximately 162,000 square cubits. But your map might have come out a very different size, depending on your printer settings. Then how can we compare answers? It is easy, if you understand ratios and proportions. A ratio is a fraction that compares one number to another. A direct proportion says one ratio is equal to another. Area is directly proportional to length squared. That means that for any similar shapes — like your map and mine — we can make a ratio comparing the area to the square of some length measurement, and that your ratio should be equal to mine. And the coolest thing about proportions is that the units don’t matter, as long as we are consistent. We can compare cm to cubits, as long as we do the same thing in each ratio. Measure (in cm) the long line at the bottom of your map. Call that length b. Multiply that number times itself to find b2. Calculate your answer (in cubits) for the area of the farm. Call it A. Calculate your ratio: A ÷ b2. That should be the same as my ratio, within a reasonable margin for differences in measurement or rounding off numbers. Would you like to know how big the farm is in “real life”? There is enough information given in the problem. You will need to use conversion factors to switch between a hodge-podge of units: cm, cubits, feet, and square kilometers or acres (your choice). I will give you this hint: Our hypothetical Egyptian farmer was not a wealthy man. Read all the posts from the May/June 1998 issue of my Mathematical Adventures of Alexandria Jones newsletter. I wonder what motivated the genesis of this myth. 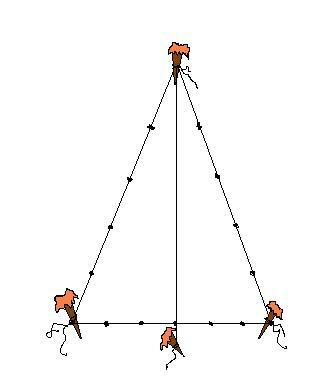 As far as I can tell, the idea that Egyptian surveyors used 3-4-5 triangles goes back at least to Moritz Cantor, and it may go as far back as the Greeks. A couple of my sources refer to Herodotus telling about how the surveyors had to recheck farmlands after the flood, and one source (Norton History of the Mathematical Sciences) says that Plutarch mentioned the 3-4-5 triangle, but in a pseudo-mystical way that sounds Pythagorean, even though he attributed it to the Egyptians. But nobody that I could find gave a reference for who first combined the two ideas. Two things to consider: First, that the ancient Egyptians were about as far before the Greeks as the Greeks were before us, so anything the Greeks wrote was already tainted by legend. Second, that the legends could have a basis in truth, but we just don’t have evidence for it. After all, we have only two major mathematical papyri. Imagine if you had two chapters from any two math textbooks—choose the best ones you know (in fact, take two entire textbooks, if you wish)—and from those pages you had to reconstruct the entirety of modern mathematics. Whatever we are missing is surely a whole lot more than the part we know about Egyptian math!